For centuries, people have relied on their trusted pet for security, sport, and companionship. Turns out, the support of a loving dog or cat can be good for your health. From providing emotional support to encouraging exercise, studies show that pets (especially dogs!) influence early signs of depression, blood pressure, and heart rate. “Companion animals may improve heart health by lowering blood pressure and regulating the heart rate during stressful situations,” wrote Dana Casciotti, Ph.D.
It’s true that some environments aren’t conducive to pet ownership, and animals aren’t ideal for everyone, as in cases where seniors are unable to care for their beloved pets. But that is why pet visits hosted by a care center are so beneficial. 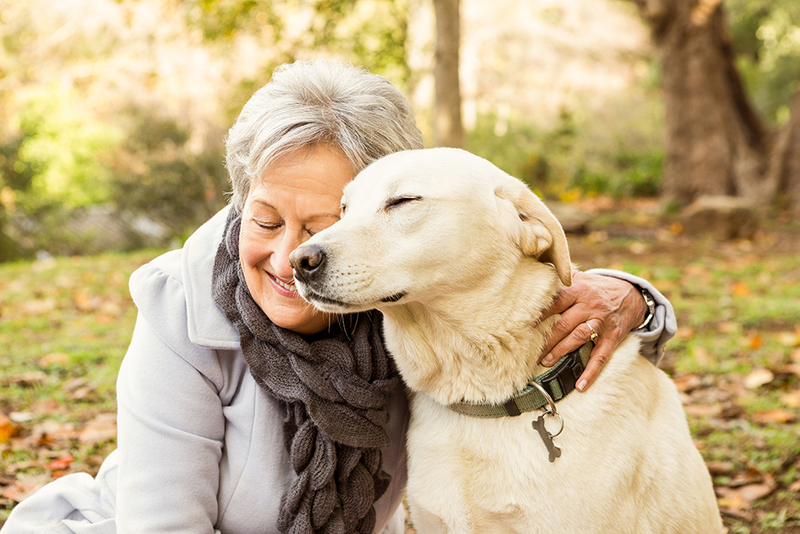 These programs offer all of the benefits of allowing a senior to connect with a pet while not requiring the need for constant care of that animal. 1. Pets provide undivided attention. A pet can share a look that says, “I understand,” without saying a word. That non-verbal encouragement generates a feeling of comfort, support, and unconditional love. Many of today’s seniors struggle with the lack of feeling needed and understood. A connection with a pet gives seniors a feeling of renewed purpose as this animal looks to them to provide food, exercise and an open lap to cuddle up in for an hour or two. 2. Pets have simple wants and needs. In most cases, a visiting pet only wants to be petted, brushed, fed, played with or walked. For a senior who has difficulty performing tasks, the ability to meet the basic needs of a pet can be satisfying; and this interaction often creates motivation to adopt a more active lifestyle. “Having a dog can be a great way to make walking a regular part of your permanent daily plans,” wrote contributor Philip Moeller. 3. Pets provide constant enthusiasm. For a dog who gets a new toy or meets a new friend, this isn’t just a good day — this is the best day ever. That enthusiasm is a nice distraction for seniors enduring painful rehabilitation, depression or loneliness. As pet visits to care centers grow in popularity, many organizations are training animals to serve specific needs. In 1983, the Hawaiian Humane Society developed the People for Animals, Animals for People program. Over 30 years later, this program is supported by over 90 volunteers and visit over 64 hospitals, hospices, and senior and health care centers with service, therapy, and visitation animals. Pamela Burns, CEO of People for Animals, Animals for People referred to a study out of the University of Missouri College of Veterinary Medicine that shows a person’s interaction with animals can increase the production of oxytocin, which elevates feelings of happiness and trust. “It also inspires the body’s ability to be in a state of readiness to heal and grow new cells,” said Burns. For today’s skilled care nursing centers, discovering ways to keep residents engaged and progressing through necessary levels of care is an ongoing challenge. “We believe social and emotional health plays an important role in maintaining overall physical health,” said Shiloh Sorensen, activity director at Parke View Rehabilitation and Care Center. By recognizing the existing animal-human bond that has existed and sustained adults for many years, you can incorporate care that satisfies the emotional needs of residents as well as physical healing.